Every once in a while, you see a car on the road that defies categorization. You have to wonder what the car designers were (or maybe weren't) thinking when they churned this hunks of metal out. These are the cars so ugly, that you honestly feel that keying them would be doing the owners a favor. Like maybe letting the air out of the tires would be a good idea, thus saving the world's eyes. Then you gather your senses and have a good laugh rather than doing anything illegal. Our tour will begin with the car that first came to my mind when I thought of hideous cars. The good old Pontiac Aztec. A revolutionary creation in crossover vehicles and cause for much weeping. Next up is the Honda Element. It looks like a cross between a stationwagon and an old shoe. This car only made the list because it's ugly. 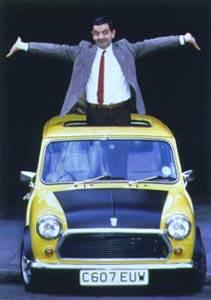 But maybe the fact that it's owned by Mr. Bean and is locked with a combination lock makes up for that. The Ford Anglia looks like it hit a wall, nuff said. 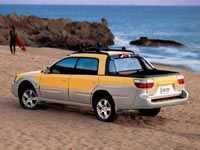 Aaah...the good old Subaru Baja. If only words could describe how ugly this car is, then maybe I could write something here. Gah! 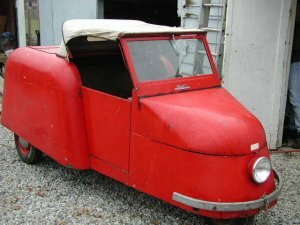 It has three wheels. The mono-light in the front is a nice touch, I think.